When I started to mix this up, I was a little concerned that it might not be flavorful enough. I was certainly wrong – the simple goodness of quality ingredients simply shines through. I used Fontina cheese, as I had some on hand, but Swiss would be excellent too. I have made this for brunch several times and also for a simple supper. The biggest advantage for the cook is that it bakes for 15-20 minutes, allowing you some time to prepare your other dishes. 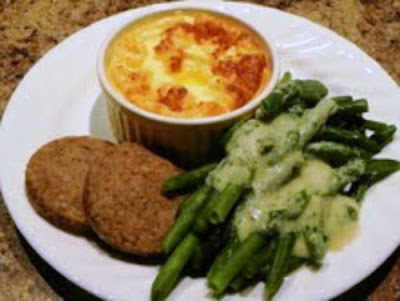 Try serving it with breakfast sausage or bacon and a fruit cup or a green vegetable for supper. In a large bowl, whisk the first seven ingredients. Stir in cheese. 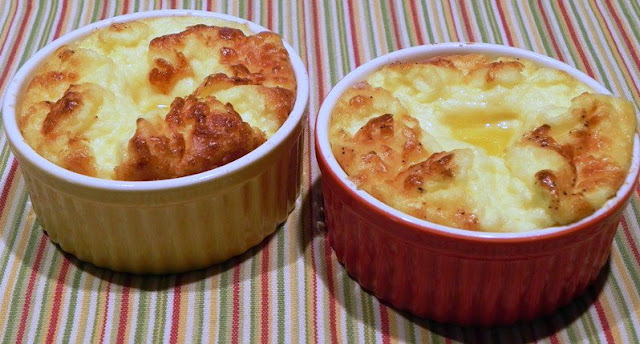 Pour into 4 buttered 4 ounce custard cups. Place cups in a baking pan. Fill pan with boiling water to a depth of 1 inch. Bake, uncovered, at 425° for 15-20 minutes or until a knife inserted near the center comes out clean. Per Serving: 218 Calories; 17g Fat (69.1% calories from fat); 12g Protein; 4g Carbohydrate; trace Dietary Fiber; 249mg Cholesterol; 344mg Sodium. Exchanges: 0 Grain(Starch); 1 1/2 Lean Meat; 1/2 Non-Fat Milk; 2 1/2 Fat; 0 Other Carbohydrates.